Editor’s Note: Julie Jee recently gave a presentation to new teachers at the 5th Annual Hudson Valley New Teacher Institute, and graciously gave me permission to reprint it here. You can see the slideshow that went with her talk here. I’m adding this post to The Best Advice For New Teachers. Julie Jee has been an English teacher at Arlington High School in New York since 2001. She teaches 12 Advanced Placement English Literature and Composition and sophomore English at the regents level. Julie loves to read, run, take photos, and spend time with her husband and three children. When did you know that you wanted to be a teacher? For me, I knew when I was in elementary school. I thought I had the basic qualifications. I loved kids. I could project my voice with the best of them after nagging my younger brother for years: “Johnny! Time to get up!” My teacher voice boomed out of my 5’2” frame with no problem. Teaching was even in my blood. My grandfather had been a high school English teacher in South Korea. When I was in college and grad school, I sorted out the big questions. Grade level? After shadowing an elementary school teacher for a couple of months my first semester in college, I knew that it wasn’t for me. I got to the point that if one more kid asked me to tie their shoe, I was going to cry. Elementary school teachers had a patience that I was definitely not gifted with. Subject area–English or history? I loved both, so it basically came down to a coin toss. Middle school or high school? Student teaching made the choice clear. High school, it was. I studied hard, put in the hours, went to grad school, threw in some experiences as a camp counselor and after school teacher, and–voilà–I was ready. But not really. I made mistakes…a lot of mistakes. Here are three that I wanted to share with all of you. Mistake #1: I let the power get to my head. There was something about that first moment I handed out a test to a class and watched my students stop talking to each other instantly and work on it silently that made me realize that I had power. Looking like I was twelve contributed to this feeling. I looked young, therefore I believed that I needed to wear a suit, speak seriously and look stern at all times. I never talked about my life outside of the classroom and really wasn’t much fun at all. I realized how much of a problem this was a couple of years into my teaching. I was upset with one of my sophomores because he hadn’t been handing in assignments and frequently absent. I asked him to stay after class one day because he had neglected to hand in his summer reading project. I looked at him, with all of the gravitas I could muster, and said that he had to get the project in to me by first period the next day, or he was going to fail. The next day, he wasn’t in my first period class. Annoyed, I mentally shrugged my shoulders and told myself that he was going to have to suffer the consequences. An hour and a half later, he walked into my classroom, soaking wet and holding a slightly damp box with literary elements written on each side. I looked at him in shock as he told me that he had missed the bus that morning. My heavy handed threat stuck with him, so he walked from his house to the high school (a distance of more than five miles) in the rain so he could give me his project. I felt terrible. I apologized, awkwardly admonished him for walking in the rain, took his project and then gave him a pass to his next class. When I looked at his summer reading book cube, my heart sank because I realized that he hadn’t completed the assignment correctly because he didn’t really understand what to do. I was so ashamed. I felt like an awful teacher. It made me realize that teaching wasn’t about power. It wasn’t about compliance. 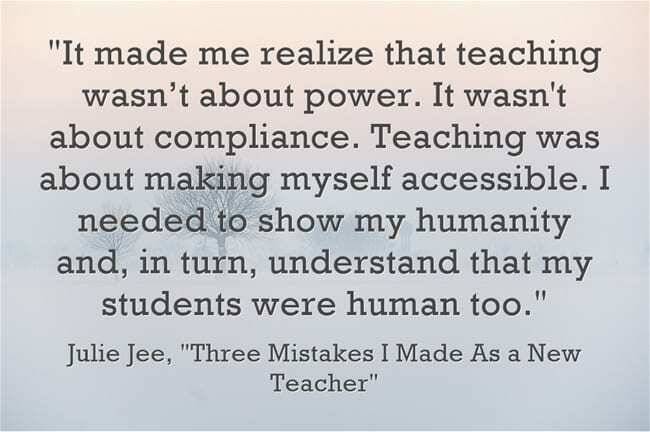 Teaching was about making myself accessible. I needed to show my humanity and, in turn, understand that my students were human too. Expectations were fine, but they needed to be tempered with understanding and honest communication. Mistake #2: I was too afraid to step outside my comfort zone. I was focused on getting to a comfortable place–figuring out the ropes, who to talk to, who to avoid, how to take attendance and how to fix the copy machine when it jammed. Once I got settled, I finally felt comfortable, so I did my best to stay off the radar and keep to myself. This went on for a couple of years. 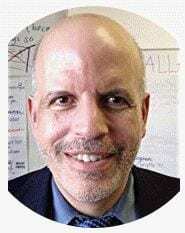 Eventually, I did venture tentatively outside my comfort zone, through different organizations like the tech team with the Hudson Valley Writing Project. Social media, in particular, Twitter, introduced me to different concepts and perspectives. I get bored with routine easily and I love learning new things, so talking to educators, both face to face and online were great; however, I stockpiled these ideas, put them away in file folders, made mental notes and basically didn’t really do much with them. This changed when I decided to have a year of no fear after coming back into the classroom after having twins. Being fearless is terrifying, but it’s pretty amazing as well. Trying new ideas like Genius Hour allowed me to de-center myself and give control to my students. Yielding the floor to what my students wanted to learn about and empowering them by sharing how failure is an option led to incredible times of authentic learning. Granted, trying new things all the time isn’t really the wisest course of action because burnout is real, but being even a little fearless and trying a new activity or two always keeps things interesting for you and your students. 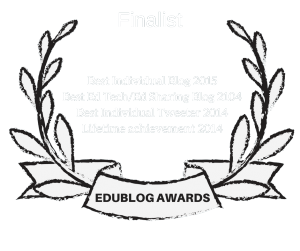 Mistake #3: I made it about me and not about my students. There were certain works of literature that I loved–King Lear, A Tree Grows in Brooklyn, To Kill a Mockingbird. There were certain outcomes that I expected–high school diploma, college degree, graduate school degree. There were certain life experiences that I took for granted as a Korean-American middle class abled heterosexual cis female. For years, I lamented how difficult it was to teach a book that I loved because my students’ indifference made me hate it. When students told me that they didn’t care about passing my tests because they weren’t planning to go to college, I was floored. College was not an option? That was a first for me. I didn’t understand that my classroom could be an uncomfortable place for some of my students who hid their identities and stayed silent during class discussions. It was only after talking to patient colleagues and friends, both at my school and on Twitter, that I realized that I was suppressing my students’ voices. My classroom should not be a Pinterest-worthy room that reflects my preference for blues and greens. My bookcase should not be filled exclusively with my personal favorites. My teaching should not center a curriculum that neglects to include the experiences of my students as well as humanity in general. 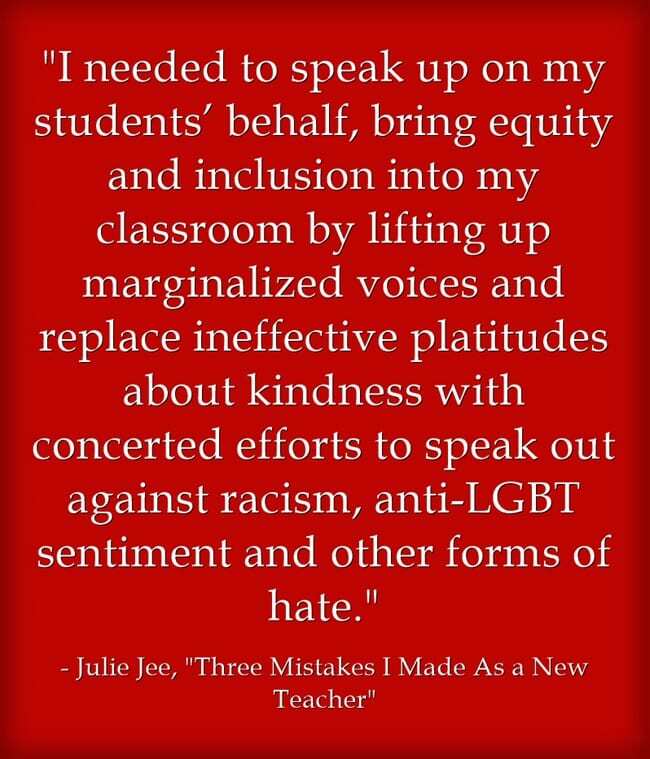 I needed to speak up on my students’ behalf, bring equity and inclusion into my classroom by lifting up marginalized voices and replace ineffective platitudes about kindness with concerted efforts to speak out against racism, anti-LGBT sentiment and other forms of hate. Rather than focus exclusively on my mistakes, I did want to talk about the one thing that I’ve done okay with pretty much since the beginning of my teaching career –I let myself breathe. It’s okay to step away from your teaching identity and enjoy outside pursuits. I stuck a little sign on my file cabinet that reads “Less stress. More joy.” It’s a daily reminder that I need to take care of my emotional, mental and physical needs. I spend time with my family and friends. I fall asleep on my couch with my two dogs. I read. I run. I treat myself to bubble tea. I also have moments to breathe when I’m at school. There are little things that I do to ease my mind and alleviate my stress. I often have flowers on my desk. I have bubble wrap therapy on my door (my students love this as well). I keep cards and letters that former students have written me over the years to remind me how much I love teaching when I’m feeling exhausted or down. And nineteen years later, here I am, not as powerful as I thought I was, not as comfortable as I once was, and not as self-centered as I used to be…but a better educator through all of my experiences, good and bad. To me, this is what it means to be a lifetime learner. I’m excited for all of you new teachers out there. I’m excited for you to make your own mistakes and grow and thrive as educators. Good luck and feel free to make lots of mistakes.